Vortex Beats the stock market! The program VORTEX is a dynamic equity trading system and an investment portfolio management system for investing in stocks, and/or its derivatives, according to the Vortex Method. With the Vortex Method it is guaranteed to achieve a considerably higher investment yield than the average yield on equity invested with the Buy & Hold Method, without it being necessary to have an in-depth knowledge of investment techniques at the start. With quite stable non-volatile stocks it is normally possible to obtain a nominal 25% annual yield while the stock remains at an average constant value (This is the Buy & Hold Zero Yield Reference Case). For an optimised system an annual yield can be reached of between 50% and 100%. Obviously these figures can only be attained after experience with VORTEX is gained. Also, these prognoses can not be guaranteed but we can provide sample cases in which these yields have been obtained. Download or view the PowerPoint presentation that illustrates the theory. Here you will find a List of books and articles about the Vortex method. Vortex may also be used to download Stock Prices. 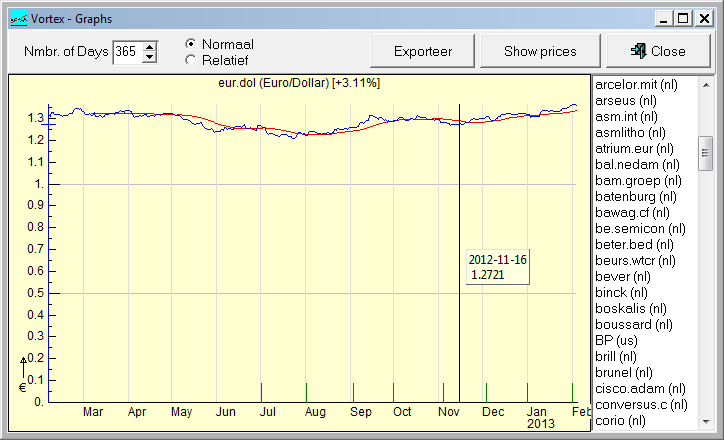 Dutch stock prices are all downloaded, other stock prices have to be specified to be downloaded. VORTEX runs under W95/98/00/NT/XP/Vista. The Demo version can be downloaded free and is fully fuctional during 30 days. Registration costs € 100,-. You will get an unlimited fully functional program. The program will alert you for updates. Registered users may download these updates freely. View the .xml file and the file. At startup of Vortex you will see the Main Window, divided in two parts. The left side is the place for the Stocks of the current portfolio. The right side is filled with all the properties of the selected stock. The History of the Portfolio is saved, so you may walk through all the old Datasets, using the Navigator Buttons. Very useful is the "Advice Generator" which generates "Market orders" that help you optimize your investment using the Vortex Method. To facilitate the user interface, Menu's as well as Speed Buttons are provided. 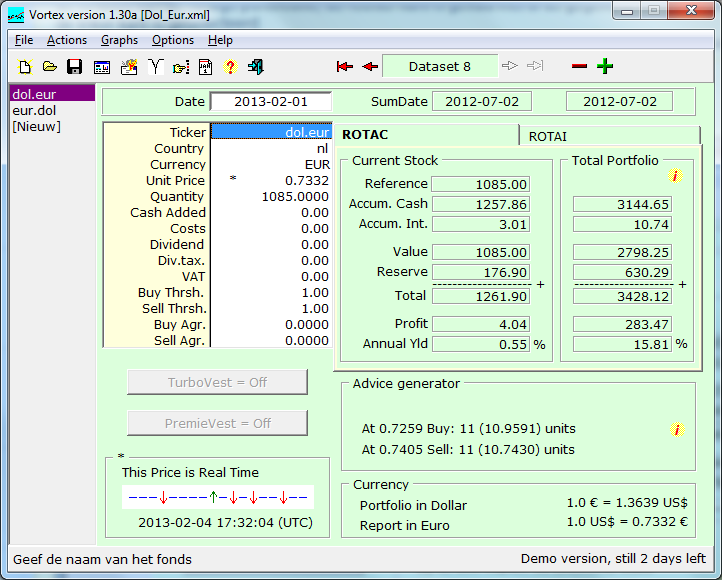 Vortex can show graphs of the Stock Prices, the Stock Values in the portfolio and the Portfolio Values. You may select a Linear or a Logarithmic vertical scale. The horizontal scale length may be any length in days (in this graph it is 365 days). At the right side of the Graph is the list of available Stocks, the Prices of which are downloaded and available for a graph. The vertical lines are the Data Sets of the portfolio where transactions have been recorded. Full Text Sensitive Help is available. Select an item in one of the windows, push F1 and the appropriate help page will be shown. Click this item, to search in the help pages. Click this item to get information about the program and the author. To start the registration process; Click the Register Button in the about window. The demo of the program Vortex is free. If you like it please register the program. For US$ 130 you get a fully functional program and you will be notified of updates and bugfixes. You can always download the latest version enjoying most of your registration. The fee for registration enables us to continue improving the program. Do you have any remarks please send them to me by e-mail. Give the demo to your friends! The program VORTEX is bi-lingual. By default it uses the System language as language. The user may override this default and select "English" or "Dutch" using the Options Menu. Download the program Vortex now. The demo is free. You may try the program without any risk; it can be simply removed from your computer ("Start | Configuration | Configuration window | Vortex" => Click the Add/Remove Button). Use this method if you want to install Vortex on a second computer or give the demo to your friends. Click "OK" and downloading starts. The file "vortex132.exe" will now be saved to the directory "c:\Temp"
Now follow the directions in the setup program to install Vortex on your computer.